Everybody’s favorite open source video player just got even better. The VideoLAN Organization is releasing the stable version of VLC 2.2.0 on Friday, packed with a few goodies ahead of the VLC 3.0.0 release scheduled for later this year. The new VLC for Windows, Mac, and Linux rocks a Firefox-style in-app extensions “store,” resume playback, in-app subtitle downloads, and early support for interactive Blu-ray menus. Friday’s VLC release isn’t just for the desktop either. For the first time, VideoLAN released major upgrades to all its platforms at once, and even added a few new ones including Android TV, Windows Phone, and Windows RT. VideoLan hopes to coordinate future release major releases across all its platforms, but organization president Jean-Baptiste Kempf says he isn’t promising anything just yet since coordinating major releases for all VLC platforms is a monumental task. But enough small talk. Let’s get to the good stuff coming to your desktop and elsewhere with the latest VLC releases. Now you can peruse VLC extensions inside the program. 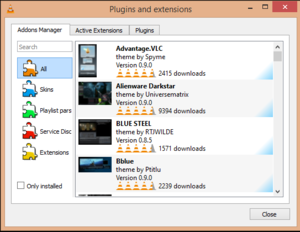 VLC has offered an extensions marketplace for some time, where you can find features such as TuneIn Radio, a YouTube playlist parser, tons of skins, and a variety of lyrics fetchers. But vefore version 2.2.0 you had to download the extensions from a website and save them to your local VLC directory. 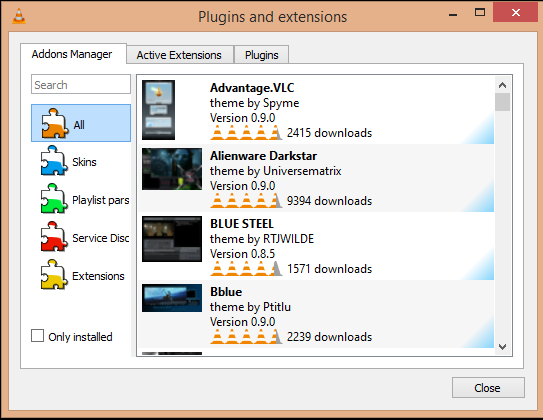 With the new extensions downloader that’s no longer necessary, as you can browse plugins and install them directly in VLC by going to Tools > Plugins and extensions. If you need a subtitle file for one of your vidoes, that’s also built-in to VLC by default now. Head to View > Download subtitles and then search by title or file hash. VLC 2.2.0 lets you resume playback on the desktop. Another nice addition in VLC 2.2.0 is the ability to resume playback—a feature that’s been on mobile versions for some time and is now on the desktop. When you open a video file you were watching previously, you’ll see a small toolbar below the VLC menu giving you the option to resume from where you left off. The rest of the app-developing world may have forgotten about Windows RT tablets, but the beautiful people at VideoLan haven’t. After VLC first appeared on the modern UI nearly a year ago, the app is finally coming to Windows RT devices rocking ARM processors. The new RT-friendly app is currently in beta and you can find it in the Windows Store on Friday. VLC also released version 1.1.0 for Android on Friday, which marks the app’s official exit from beta on Google’s mobile platform. Version 1.1.0 has also been updated so that most of the UI matches Android’s Material Design. There’s also the first public beta release of VLC for Android TV, as well as a debut beta for Windows Phone. VLC will automatically detect when a video is displaying vertically and then rotate it using hardware acceleration. VLC only does this for MP4, MOV, MKV, and h.264 video files on select platforms, however. VLC 2.2.0 also supports Digital Cinema Packages, which are used in movie theaters. Additionally, there’s also experimental support for interactive Blu-ray menus. Linux, Raspberry Pi, and Android users now have a new hardware acceleration mechanism that other platforms will see in version 3.0. If you have an UltraHD (4K) display at home, VLC should now do a better job of using VP9 and H265 codecs. Finally, Mac users should notice an interface that is better updated for Yosemite on version 2.2.0. This won’t be the last major upgrade for VLC in 2015. VLC 3.0.0 is slated for release later in the year, with features such as adaptive streaming, MPEG transport (TS) streams, and “partial” ChromeCast integration. Update: You might also be interested in reading our hands-on impressions of the Windows version of VLC 2.2.